Ruinart converted its 800-year-old underground chalk cellars into the ultimate art studio. “This place is full of secrets,” says Maison Ruinart’s hospitality manager, Olivier Livoir, as we sipped rosé Champagne in a 125-foot-deep chalk quarry. Under the French city of Reims alone, thousands of these chalk quarries, or crayères, form a mazelike collection of tunnels that started as chalk mines in Gallo-Roman times (with excavated chalk forming the city’s rampart walls) before serving as everything from wheat silos to smuggling routes. 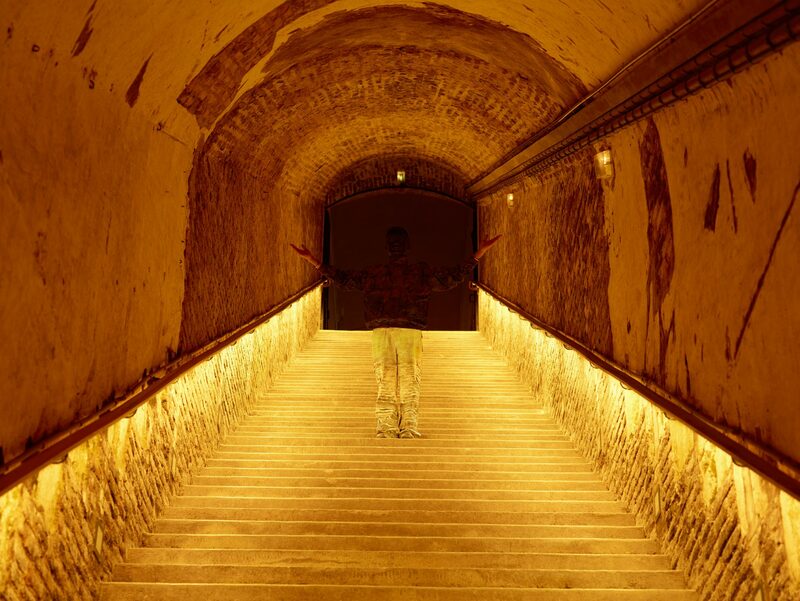 Nearly five miles of hand-dug chalk tunnels silently snake their way under Maison Ruinart, opening up to over 20 caves—the deepest in the region and only crayères to be classified a national monument—where the world’s oldest established Champagne house ages its collection of cuvées. Glancing up at the cathedral-like ceilings, which spiral nearly 100 feet above your head, signs of the crayères’ colorful past are as subtle as the strokes of the picks that originally carved them. 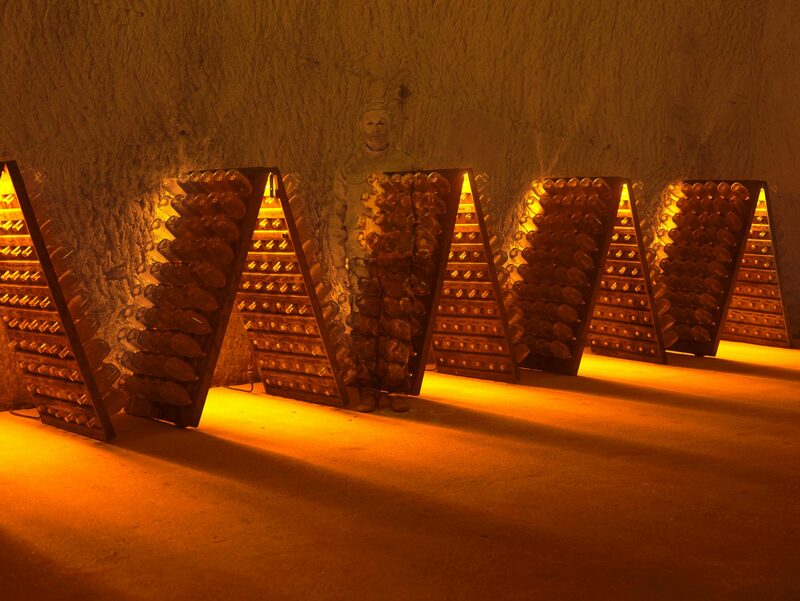 In the 18th century, Claude Ruinart, the founder’s son, is said to have rappelled down with a double rope to explore the crayères, later transforming the quarries into the region’s first Champagne cellars since the naturally cool climate helps these bubbles mature beautifully in their bottles. When the maison was destroyed during the First World War, sixth-generation owner André Ruinart moved his office underground and transformed the chalk cellars into the city’s bomb shelter. A few decades later, Nazis ransacked Ruinart’s crayères, making off with their entire stock of pre-war vintage. These are the kinds of stories that slowly seep out over the course of a Champagne-fueled evening at Ruinart. “We can’t give away all of our secrets at once,” says Frédéric Panaïotis, Ruinart’s chef de caves, or cellar master, with a smile. The team perpetuates the mystery of the crayères, leaving a few of its secrets—and its caves—to still be discovered. 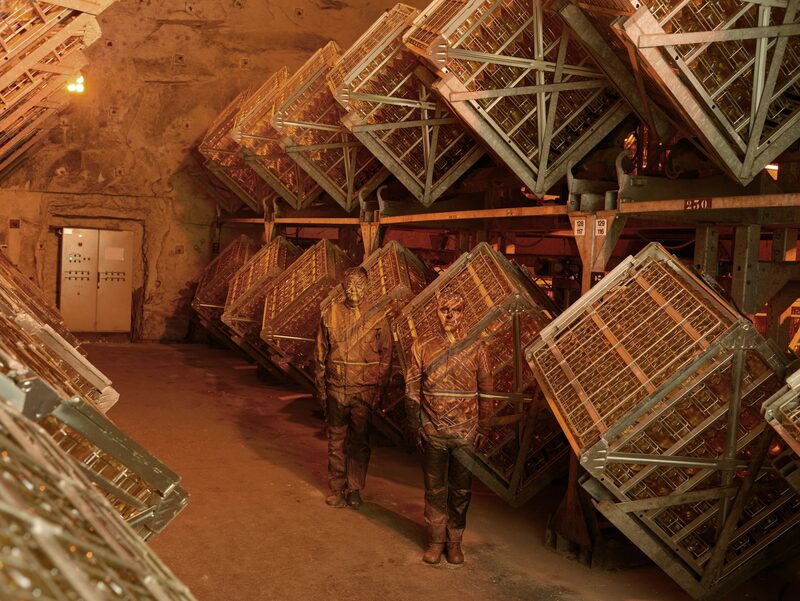 During a 10-day residency at Ruinart last August, Beijing-based artist Liu Bolin stumbled upon one of these “secret” cellars. It’s easy to glance over the centuries-old graffiti roughly carving out names and dates like “1898,” but for Bolin, these were the details that first caught his attention and prompted a photoshoot in the depths of the crayéres. “Having started out as a sculptor, the date (1898) and the word (Classe), which are etched on the wall, struck me immediately,” the artist explained in a statement about his collaboration with Maison Ruinart, which resulted in a collection of eight images that will be displayed at art fairs around the world, including Frieze in New York. While shooting in the dining room on a Saturday, he decided to run across the courtyard to Ruinart’s art collection to check that the white he painted on his clothing perfectly matched the white of the original poster. A tour group watched as the artist dashed into the room and put his sleeve against the poster—considered the world’s first Champagne advertisement—giving guests a quick glimpse into the work of The Invisible Man before he once again blended into the backdrop amongst the winery’s bottles.